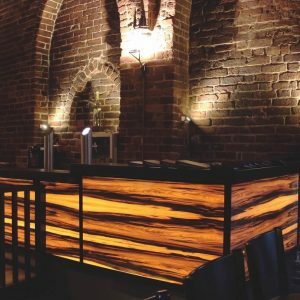 The design lamps by WOODEN Germany are all unique by the use of real wood veneers. 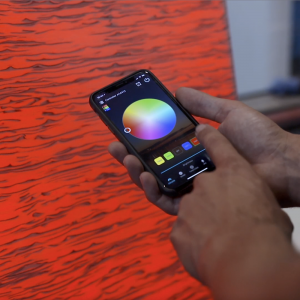 You can configure your own luminaire by choosing from three colors and eight veneers. From bathroom furniture to handrails – we let the wood shine. Our assortment ranges from bedside lamps, floor lamps and pendant lamps to illuminated furniture, such as our bathroom cabinet SPLASH and even our unique handrail REED. For some people it’s the future, soon it will be everywhere, but we have it already. Our products are equipped with a smart home controller and have many features, like color changing, time shift function, dimming, music mode and voice command via Alexa by Amazon Echo or Google Home. The smart home features can be controlled without internet connectivity. WOODEN products are a smart and stylish solution for lighting. Comfort Light brightens the spirit and warms the soul. Various studies confirm the influence of light on our well-being. Warm and cold white light has different effects on the state of mind and hormone balance. 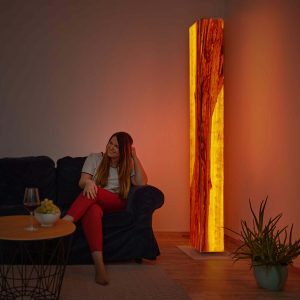 A positive result can be achieved with the lighting of wood by LED, which creates a fireplace-like atmosphere through this combination with its red-orange-yellow tones. Comfort light has a calming effect on us. We develop customized solutions with our customers and create the luminous part of their project. Individual lighting elements can be individually developed for a specific application and also combined with lights from our product range. Our illuminated wood panel is an extraordinary eye-catcher and offers all the smart home features like our standard products. We develop solutions for our business partners and private households.